Search Results for: "dutch disease"
When Sue and I visited New Zealand in 2004 we found a wine industry experiencing tremendous success, but worried that the good times might not last. It seemed like New Zealand’s wine production was doubling every few years — could global markets continue to absorb so much Kiwi wine? Eleven years later the conclusion is that global consumers still love Kiwi wine, but the concern is still there for the future. A Kiwi Variant of the Dutch Disease? There were lots of worries back in 2004. One was a kind of Kiwi variant of the “Dutch Disease” — the concern that tremendous success in one part of the wine industry would put a curse on the rest of it. Would the triumph of Marlborough Sauvignon Blanc crowd out other regions and winegrape varieties and leave New Zealand uncomfortably reliant on a single type of wine? But that wasn’t the only problem people saw then. Ironically, we met with one very successful Marlborough producer who was worried about Pinot Noir messing up Sauvignon Blanc. 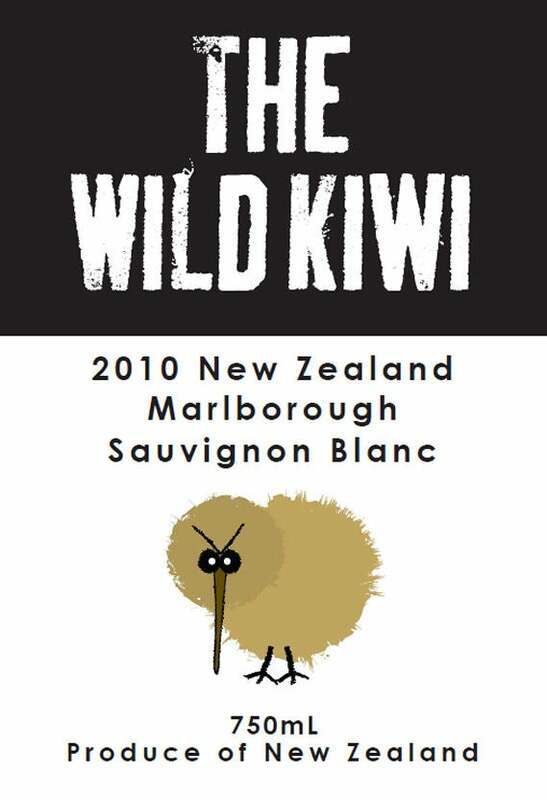 New Zealand’s brand is Marlborough Sauvignon Blanc, he told us. Giving more attention to Pinot Noir risks confusing consumers about the Kiwi wine identity and killing the goose that lays the golden egg. Put all the chips on Marlborough Sauvignon Blanc and make sure that very successful and profitable wine doesn’t fade away, he advised. Eleven years later I think the concern about reliance on Sauvignon Blanc is still around, but I’m not hearing much talk about Pinot Noir getting too much attention for the industry’s good. And that producer who wanted to deemphasize Pinot is now proud to make some highly-regarded Marlborough Pinot Noir in addition to his Sauvignon Blanc! So a lot has changed even if some things stay the same. One concern that is still on the agenda is terroir and its importance in marketing the wine by telling an authentic terroirist story. As I have suggested in previous columns, terroir designations have morphed from a protective tool in Europe (an attempt to control fraud, for example, and protect geographical trademarks) and a brand issue here in the U.S. (brand Napa Valley) to an indicator of authenticity in the story-telling necessary to effectively sell wine today. It’s terroir time in wine world. Upscale consumers want to have authentic stories to go with the products they buy — this is true for wine and other products — and a specific geographic designation is one way (but not the only way) for winemakers to tell that story. Some of the people we talked with in Marlborough back in 2004 were thinking in terms of protection and brands and they were worried by New Zealand’s lack of a stronger geographic indicator system for wine. Marlborough is a very large designation, one producer told me, and it is a powerful brand for Sauvignon Blanc. But it is such a big and diverse area, he said, and the wines are so diverse in terms of style and quality. He was afraid that as production was ramped up the lack of consistency would undermine Marlborough’s credibility. Private efforts to stress particularly excellent sub-regions did not seem to be getting traction and official actions looked slow in coming. Would Marlborough’s success ultimately undermine its credibility? That’s the pattern that I called “the Curse of the Blue Nun” in Wine Wars. NZ-based wine writer Rebecca Gibb recently wrote about the movement to identify key Marlborough zones for Pinot Noir, concluding that as appealing as the idea is it might be premature. Maybe Kiwi winemakers are still learning where the the best places are to grow particular varieties, Gibb says. If she’s right then it was certainly too soon back in 2004, when the zones might have been crafted with SB, not Pinot, in mind. And Jamie Goode has recently cautioned about the movement to adopt geographical indicators in general. We visited Hawkes Bay on the North Island in 2004 and some of the winemakers there were impatient with Kiwi geographical indicator policies. Growers in the Gimblett Gravels knew that they had special terroir and, having saved it from exploitation as a gravel quarry, wanted to both protect it and brand it. But how? They did both in the most direct way available to them, forming an association, registering “Gimblett Gravels” as a trademark and rigorously regulating its use. In essence I guess they “privatized” their terroir designation because they were frustrated with the lack of a clear public path. Here is an explanation from the GG association’s website. GIMBLETT GRAVELS is the registered trademark of the Gimblett Gravels Winegrowers Association. The Association and registered brand were developed to define and then name a winegrowing district using principles that are not catered for within New Zealand’s proposed Geographic Indications Act legislation. … The Association and designation of the area was formed at a relatively early stage in its winegrowing life to ensure that the purity and integrity of its designation was not compromised by political issues outside its control. … To the best of our knowledge this is the first viticultural appellation in the New World where its ultimate boundary is defined by a distinct soil type boundary, no compromises, no politics. The approach taken has determined that a carefully planned and professional branding program was required to promote the Gimblett Gravels Winegrowing District as a viable sub-region within the Hawke’s Bay region. The lack of any legal Geographic Indication status for Gimblett Gravels Winegrowing District has determined this approach. The branding program has developed a strong logo and branding platform that controls the use of the name “GIMBLETT GRAVELS” and “Gimblett Gravels Winegrowing District”. I suspect my friends here in the U.S. who are caught up in various aspects of AVA and sub-AVA politics will look at the Gimlett Gravels initiative with respect, admiration and even a bit of envy. What a bold move! And I think it has been very successful, too. Terroir and geographical indicators have grown and changed in their significance. Where does New Zealand stand today? Come back next week for a quick look at progress on this front both in private sector branding and in Kiwi wine policy. I’m just back from the San Francisco Treasury Symposium where I gave the luncheon keynote speech on “Wine Boom and Bust — With Lessons for Finance in the 21st Century.” You might well ask what business a wine economist has speaking to a group of treasury executives (I asked that question myself! ), and the answer has two parts. First, I actually know a little bit about global finance from my day job as a university professor. I’ve written frequently about global financial flows and especially the periodic crises that seem to plague them. The other reason is that the conference organizers thought it would be interesting and different to hear someone talk wine, but in a way that would still be relevant to their treasury executive audience. So that was my challenge. Money and wine are closely tied, although it is an asymmetrical relationship. It is pretty easy to convert money into wine, for example. In fact, it may be a little too easy to do this. Some of my friends report that the whole “money into wine” thing has gotten way out of hand for them. You probably know the problem from personal experience if your cellar has grown bigger than your bank account. It is harder to convert wine into money, especially if you are in the wine business. The best way to make a small fortune in wine, people tell me, is to start with a large one. I focused on three aspects of wine economics for my talk: globalization’s opportunities and threats, the “new rules of the game” and the need to embrace (or at least accept) volatility. All these points apply to both wine and 21st Century finance. Globalization offers a world of opportunity to winemakers and financial managers alike, but it is a complex world and a very competitive one. New markets open their doors … but your market doors are open wide, too. Optimists will see the wine glass more than half full and seize the opportunities that present themselves, hopefully taking the associated costs and risks into account. One problem with globalization is that the risks are so difficult to fully evaluate. The Australian wine industry, for example, is currently suffering from a bad case of globalization gone bad and part of the problem has nothing directly to do with wine. Although the Crash of 2008 slowed down the global economy, China continues to surge ahead, its demand for natural resources (one of Australia’s strong sectors) growing year after year. Australian has come down with a bad case of the “Dutch Disease” where success in one sector causes chaos elsewhere. As mineral sales have increased, the strong Australian dollar has depressed the already weakened wine industry by discouraging exports. Click on the “Dutch Disease” link to see my report on this problem. Global finance is dominated by a number of key financial centers that set the “rules of the game” for money. Wine works the same way, but the centers have shifted and the rules of the game have changed. Producing nations (think France and Italy) once determined the rules of the game with their AOC designations. The center shifted to Great Britain, Germanyand the United States in the last 20 years and now the rules are written by those who sell wine (think Tesco, Costco and Aldi) more than by those who produce it. The most successful wine sectors so far are those that have best adjusted to the new rules. The rules will change again soon, I suspect, as the BRIC and new BRIC nations make their wine market influence felt. I think finance will also experience shifting centers with new rules and have to adjust accordingly. Volatility was my final point and wine markets have plenty of it. Boom and bust cycles seem to be “baked in the cake” in both money and wine. I talked about Australia’s five big wine booms and busts in the past 150 years and characterized them in terms of Hyman Minsky’s famous “seven stages” description of financial crises. Booms and busts are bad enough, but wine markets also suffer from medium-term cycles of surplus and scarcity as illustrated by the Turrentine Brokerage “Wine Business Wheel of Fortune.” High prices today sow the seeds of low prices a few years down the road, according this analysis, which is based on the well-known “cob-web” model of lagged adjustment in agricultural markets. Anyone who has tried to guide their 401k portfolio (much less manage corporate financial affairs) knows how volatile financial markets can be – the wine world’s bubbles and cycles must seem pretty peaceful by comparison. Wine and money may be very different, but the problems they face bear a certain resemblance, don’t you think? What can wine teach money in these uncertain times? One lesson, I proposed, is to “think global but drink local.” This sounds pretty simplistic, but it captures trends that I see in wine today. Economic imperatives have made both global and local markets more important than in the past. Developing direct sales vectors and developing and maintaining personal relationships is high priority today. Wine (like money) is a relationship business that needs constant attention. But it’s useful (and often necessary) to keep a global mindset even as you cultivate local markets. The world is getting bigger and smaller at the same time and the rules of the game continue to change. The second lesson is what I call “Boulding’s Law” after Kenneth Boulding, the famous economist. Boulding once made a study of the history of the future. He looked at what people thought about the future at various points in time and then did a “fast forward” though the history books to see if they were right. His conclusion? When the future came around people were usually surprised. It wasn’t what they expected at all (even if it was exactly what they predicted years before!). Hence Boulding’s Law: The best way to prepare for the future … is to prepare to be surprised. That holds for wine, I think, and for money, too. Thanks to the San Francisco Treasury Management Association for inviting me to speak at their symposium. Special thanks to Jim Lindsay and Larry Goldman. This series of posts has taken Goldman Sachs executive Jim O’Neil’s list of BRIC and New BRIC nations and examined them from the particular perspective of wine. All of the BRICs (Brazil, Russia, India and China) and New BRICs (South Korea, Mexico, Indonesia and Turkey) produce wine. They have glorious pasts, tempting futures, and face certain present challenges linking the two. In a sense (but I don’t want to push this too far), the challenges and opportunities that these countries face in terms of wine reflect their overall national situation. In vino veritas? Yes, I think so, but not just in the usual sense. Read the individual posts and you will see what I mean. So now I turn at last to the overlooked BRIC: South Africa. With a relatively modest population (less than 50 million), it was probably too small to qualify for O’Neil’s signature group in terms of market size. But South Africa punches above its weight in many fields and has great symbolic importance, too, which is one reason it was chosen to hold the 2010 soccer World Cup. If South Africa is too small to be a BRIC in gross domestic product terms, it towers over many of the other countries with respect to wine. South Africa was listed at #8 on the world wine league table for 2007 according to OIV statistics, with 9.7 million hectoliters of wine production, just behind Germany and head of Australia and Chile. Among the BRICs only China produces more wine (12 million hl, #6 on the list), although it isn’t clear that all Chinese wine is actually wine or really made in China. Like many of the BRICs, South Africa has a deep wine past and a sunny future — it’s the present that’s problematic. The first wine was pressed on April 6, 1652. The famous Groot Constantia wine estate was established outside of Cape Town in 1682. By the 18th century its eponymous Muscat-based sticky was one of the three most sought-after wines in the world (Tokaji from Hungary and Cotnari from Romania completed the tasty trio). South Africa’s wine history has been filled with peaks and valleys, both the usual ones for wine producers and some that are country-specific. Phylloxeria, persistent over-production, and difficulty breaking out of the fortified wine cycle to produce quality dry table wines are familiar stories. Apartheid — the notorious South African exception — damaged the industry by effectively shutting off export markets and distorting domestic demand. South Africa’s fast emergence in the world of wine in the last 20 years has been exception in a good way. South Africa surpassed France (France!) in U.K. wine sales in early 2010. I would like to say that South Africa is poised to beat all the BRICs and assume a place at top of the wine wall, but I hesitate just a bit. Part of it is due to the exchange rate. South Africa has a reputation for good value wines and it is suffering just now from a case of the Dutch disease. 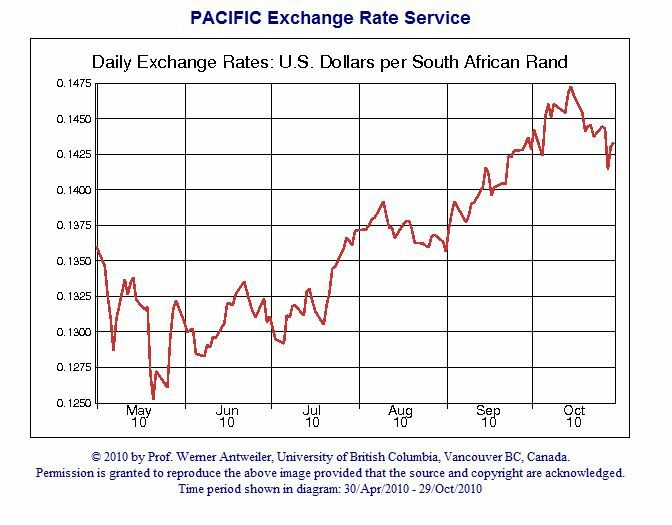 The Rand’s value has increased by more than 40% in the last two years (higher gold prices are part of the story) and the higher exchange rate has cut South Africa’s competitive advantage. But there are lots of disturbing factors. If you search the Decanter.com website for “South Africa” you get lots of good news (booming sales, distinctive varietals, demand so high there have been grape shortages) and bad news, too (burnt rubber aromas, persistent grape surpluses, Pinotage image problems). U.S. sales of South African wines have actually fallen by about 10 percent in the past year according to Nielsen data published in the most recent issue of Wine Business Monthly. Perhaps it would be the same with a news search for any wine region — lots of good, bad and ugly news to go around — but coming off the Apartheid era of dreadful news, South Africa needs more than a bit of sunshine just now. So I am left a bit uncertain, honestly. Optimistic but realistic, too. And I think this is my opinion of the BRICs and New BRICs generally. The wines and the countries that produce them will succeed, no doubt, but not without a struggle, if only because the times we live in are so uncertain. Mother nature and human nature are both very fickle and wine cannot help but reflect them both. The video up top shows how South African winemakers used the occasion of the World Cup to try to market their wines abroad. A good idea, but I think there was a better one that they missed. These days South Africa is trying to use wine as part of their program of Black Economic Empowerment by promoting black owned wineries and vineyards. It’s still in the early stages, but I like the idea. Given this, it seems to me that Invictus is a better image for South African wine than Bend It Like Beckham. Sometimes I feel like a broken record when I write about the Australian wine industry: bad news, bad news, bad news. Most recently the bad news was the Dutch Disease. 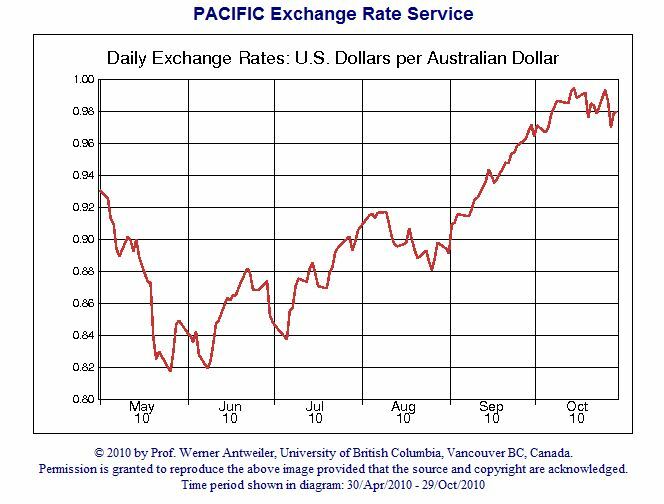 Australia’s mineral export success has driven up the foreign exchange value of the Australian dollar, making imports cheaper and exports (including wine exports) more expensive abroad. That’s just what the shell-shocked Australian wine industry needs — higher prices or slimmer margins in key export markets! But now the bad news is even worse — the strong Aussie dollar is driving down wine prices in Australia’s domestic market and slashing producer margins there, too. How? Through “parallel import” programs that crafty retailers have put into effect. An article from the Sydney Morning Herald explains the situation. Parallel imports are a consequence of a very common practice called international price discrimination. Price discrimination is the business strategy of charging different prices to different customers for similar or even identical products. Different buyers have different ability to pay and price sensitivity and it is sometimes possible to charge some customers a high price and others a low price in an attempt to extract all possible revenue from the market demand curve. Classic examples of price discrimination include the highly complex pricing system that airlines typically employ with some seats being sold for four or five times the cheapest fare depending on when and how the ticket is purchased. Student and senior citizen discounts are relatively benign and generally accepted price discrimination examples. International price discrimination is the practice of selling similar goods at different prices in different countries based on local demand conditions. In the case of Australian wine, for example, it appears that local wine market conditions in Brazil or Malaysia might cause winemakers to want to sell products there at lower prices than in the more mature domestic market. If the prices are set correctly, the combination of lower prices in some markets and higher prices in others can maximize the winemaker’s profit. The key to price discrimination, according to your Econ 101 professor, is to prevent resale. The whole strategy backfires if someone finds a way to buy your products in the low price market and resell them (undercutting your sales) in the high price market. This fact limits price discrimination to situations where resale is costly, difficult or just plain impossible. If someone finds a way to sell your discounted product back to the home market, the logic of price discrimination explodes. Parallel importing is … hurting business as supermarket chains and some of the bigger independent bottleshop chains bypass Australian brand licensees and import from third parties in countries including Brazil, Malaysia and the US. Parallel importing hit record levels in the past year as the dollar continued to strengthen and retailers, looking for ways to drive prices down and exert control over their suppliers, became more aggressive in importing. Some Australian producers are thus getting a double squeeze in their home market. They are exporting wine at the slimmest of margins (because of lower foreign market prices and the strong Australian dollar’s impact) only to see the wine shipped right back and sold by local retailers, undercutting their plans for higher margin home market sales. 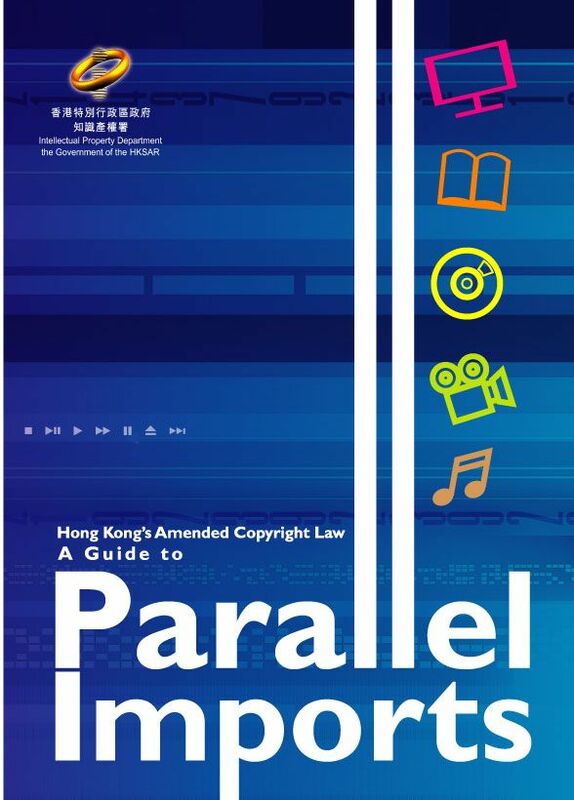 Why do they call these “parallel imports?” I imagine it is because the imports and exports form two parallel lines, with cargo ships full of outbound and inbound wine containers crossing mid-ocean. 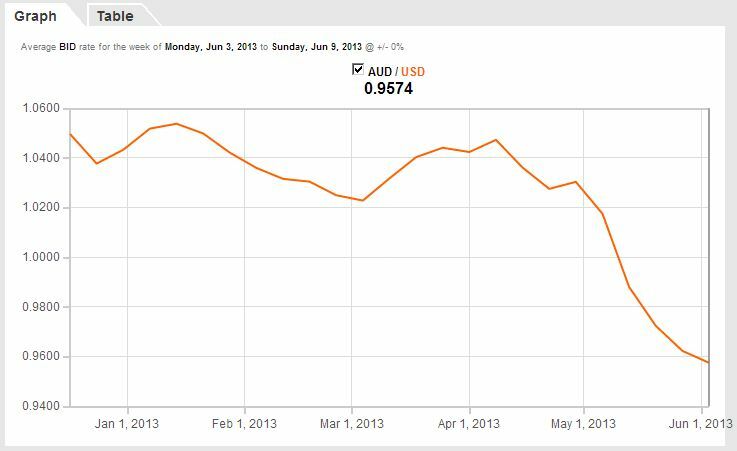 Australian wine producers need to cross their fingers that even more bad news is not in the cards. Special thanks to my Australian informant “Crocodile Chuck” for tipping me off to this situation.